Gay was born on January 22, 1856 in Hingham, Massachusetts. In 1875, he began his formal training as a painter, joining a studio on Tremont Street to draw from live models. Like many young painters in Boston, Walter Gay sought the guidance of William Morris Hunt, the influential teacher and painter who had enlightened the country about Jean François Millet and the Barbizon School. Hunt encouraged Gay to follow the path he himself had taken with Gay's uncle, Winkworth Allen Gay, and seek instruction in France. With earnings from a few picture sales supplemented by financial help from new patrons, Gay headed to Paris in 1876; he immediately entered the atelier of Léon Bonnat, where he soon met lifelong friend, John Singer Sargent. France would be Gay's home from then on. As he and his wife Matilda prospered, they were able to keep an apartment in Paris as well as Le Bréau, an 18th century chateau near the Fontainebleau forest. The expatriate couple thrived within a wide social circle that included many American and French artists and writers: James McNeill Whistler, Mary Cassatt, Edith Wharton, and Henry James, among them. 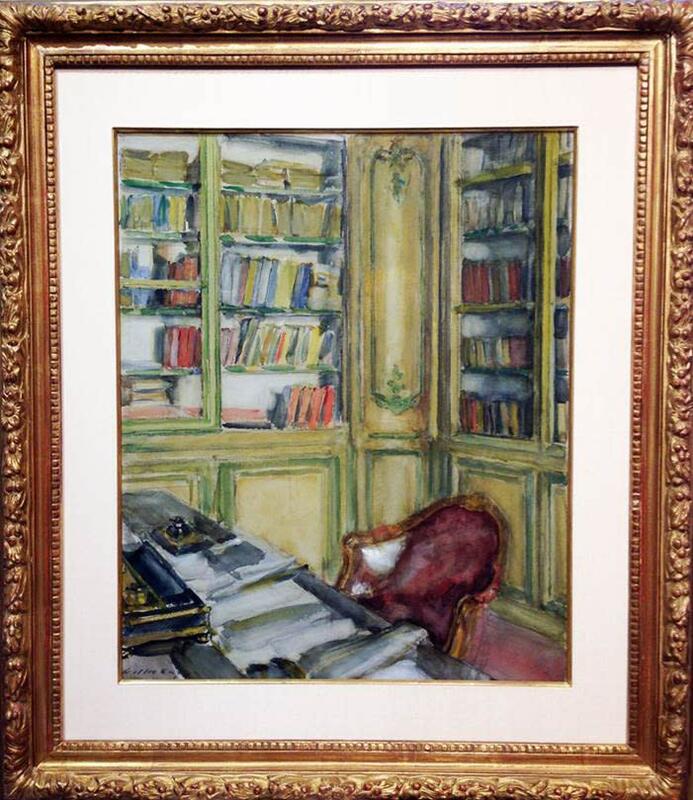 When the artist died in 1937, he was dubbed the "Dean of American Painters in France" in his New York Times obituary. Built in 1705, the four-story Château du Bréau was located on a 300-acre walled park near the Forest of Fontainebleau. Walter Gay and his wife Matilda purchased the house in 1907, and hosted many famous names of the age, including Edith Wharton, Henry James, Elsie de Wolfe, Mrs. William K. Vanderbilt, John Singer Sargent, and Paul Helleu. Admired by all who visited, the house is said to have been Edith Wharton's model for the Château Givre in her novel, The Reef. 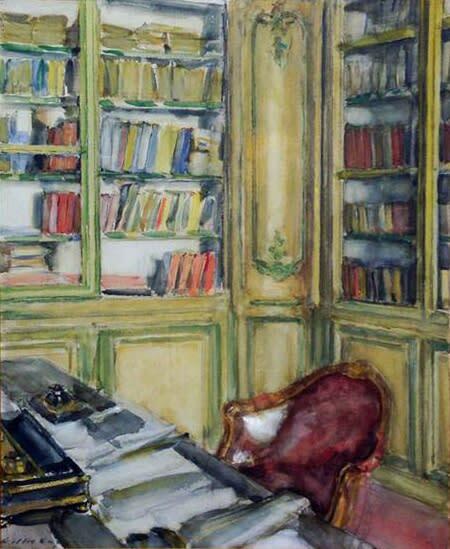 Walter Gay painted several views of the library at Bréau and one, an oil depicting the same corner of the room as the present watercolor, was acquired from the artist by Archer M. Huntington and given to the Smith College Museum of Art in Northampton, Massachusetts in 1925. A vast majority of Gay's works were interior views of rooms decorated in a lavish 18th century French style. The artist claimed to be "searching for the spirit of empty rooms—interiors". Judging from the enthusiastic response of wealthy collectors on both sides of the Atlantic, he certainly found it. While Gay executed his commissioned pictures quite straightforwardly, capturing all the elements of the chosen room, in portrayals of his own residences, he was more experimental in both objects displayed and points of view.